Learn more about Augusta, Maine using the City Guide below. Plan a trip, find local shopping centers, or just discover what makes Augusta, Maine so great! 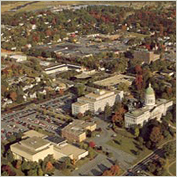 Augusta is the state capital of Maine in the United States. Augusta State Airport (IATA: AUG), 75 Airport Rd, +1 207 626-2306. Small regional airport with regular US Airways Express flights to Boston's Logan International Airport. Located about 1/2 mile west/northwest out Western Ave (US-202/ME-17/ME-100/ME-1) from roundabout/rotary nearest the State Capitol. From Portland: take US Interstate I-295 North toward Falmouth; this becomes I-95 North; follow signs for Augusta. Exit at Augusta/Western Ave, and turn right, east, into Augusta; trip is under 60 miles, about one hour total in reasonable traffic. From Bangor: Take I-95 South to Augusta/Western Ave, and turn left, east, into Augusta; trip is about 80 miles, a bit under 1 1/2 hours in reasonable traffic. From Belfast: Take Maine State Route 3 South (really west/southwest); trip is about 47 miles, or about one hour in reasonable traffic. State Capitol Building, State St, +1 207 287-2301. The west entrance is open to the public M-F, 8 AM-5 PM. Free guided tours are offered M-F 9 AM-1 PM. Free. Maine State Museum, State House Complex, State St (across the parking lot from the State Capitol Building), +1 207 287-2301, TTY: +1 207 287-6740, Tu-F 9AM-5PM. Sa 10AM-4PM. Closed Su, Mo, and state holidays. Exhibits focus on Maine-specific: natural history; prehistory and archaeology; natural resources and agricultural and industrial history; working people and manufacturing; and identity. Of particular interest is the reassembled two-story woodworking mill. $2 ($1 for children aged 6-18 and senior citizens aged 62 and over, free for children under 6, $6 family maximum). Old Fort Western, 16 Cony St, +1 207 626-2385. Hours vary depending on season: Memorial Day weekend to July 3: every day 1-4 PM; July 4-Labor Day: M-F 10 AM-4 PM, Sa, Su 1-4 PM; Labor Day-Columbus Day: Sa, Su 1-4 PM; November-May: first Su of the month only, 1-3 PM. Built in 1754, this is the oldest surviving wooden fort in North America (the main house is original). It is a National Historic Landmark. Near the rebuilt stockade overlooking the Kennebec River is a 1912 marker recording the September 1775 departure from the fort of an expedition under Benedict Arnold for the capture of Quebec. $5 ($4 for seniors aged 55 and over, $3 for children aged 6-16, free for children under 6 and residents of Augusta). Several of the popular chain restaurants are available as well. Rebecca's Place, 434 Eastern Avenue, 207-623-8142. Riverfront Barbeque & Grill, 300 Water St., 207-622-8899. America's Best Inn, 65 Whitten Road, +1 207 622-3776 (fax: +1 207 622-3778). Best Western The Senator Inn and Spa, 284 Western Avenue @ Turnpike 95, +1 207 622-5804 (toll free: +1 877 772-2224, fax: +1 207 622-8803). Holiday Inn, 110 Community Drive, +1 207 622-4751. Motel 6, 18 Edison Drive, +1 207 622-0000 (fax: +1 207 622-1048). Senator Inn & Spa, 284 Western Avenue, 207-622-5804 or 877-772-2224. Travelling to or from Augusta, Maine? Find flight to or from Augusta, Maine with an Online Travel Agency. Get lodging information or make reservations with a Local Online Hotel. Plan ahead and reserve a car with a Local Car Rental Agency. Are you relocating to Augusta, Maine? Goods & Services in Augusta, Maine.